Today's random set is 1095 Super Sub, released in 1999. 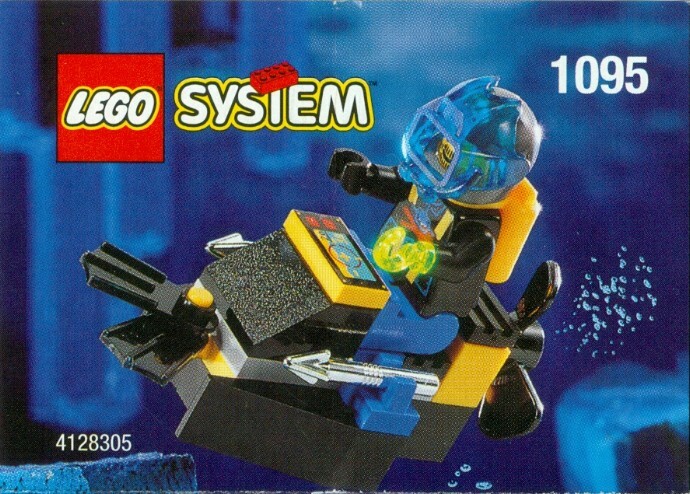 It was the only Aquazone set released that year. It contains 24 pieces and 1 minifig, and its retail price was US$3. It's owned by 456 Brickset members. If you want to add it to your collection you might find it for sale at BrickLink or eBay. Haha at least this has some plausible method of thrust. Or at least ANY method of thrust. Unlike some sets we’ve had recently. THIS was my first set ever, so many magical moments recreated in my mind thanks to Huwbot! What individual faction is this guy a part of, though? It's like he's scavenged bits from everyone. The flying machine very clearly ran on magic, which was totally justified in-universe... this guy doesn't even have a sealed scuba helmet, although he does have a pretty sweet control panel. I wouldn't want to have to write the Risk Assessment for this piece of kit; that exposed propeller whirling away next to tanks of compressed gas makes me feel queasy. I totally understand why this guy has a hook for one hand. Divers... Just can't get enought of them in my collection. I got this set just for the minifigure. This guy has a transgreen hook?! That makes this set immediately awesome. Well, at least he's got a positive attitude. 1995. Aquazone. The theme that got me off my beloved Pirates theme. The brilliant space-like theme , but underwater. The Lego booklet complete with captions showing the ongoing crystal battle between the Aquanaughts and Aquasharks - I was hooked and had to have all the sets. Which I did. Then I came across this set. Quite what faction this guy is from is anyone's guess. Yellow and black colour scheme gave no clue, Shark top and hook, but Naught helmet and weird yellow space air pack. I don't think this ever came out in the UK or at least very accessible. But a very weird set indeed. Set 6100 (Same set, different name, 1998) was set of the day on 2 January 2019, so that's why it seemed to appear again. 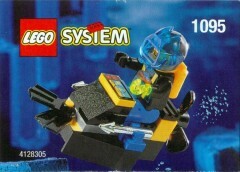 Still, I have this (or couldve been the same set 6100), and love the neon hook hand. And this, like many of my sets up to the year 2000 this is still intact and built, just at a different location from my post-dark age collection (2015+). The vehicle itself is a bit of a hybrid mix of Aquanauts and Aquasharks in color, but the figure surely has a shark torso. Still it fit right in with my Shark Scout and Deep Sea Predator sets from 1995. Flippers on the front! You know, for Hydrodynamics!